WWF started its projects in Azerbaijan in early 2000. It was legally registered as a Branch Office of WWF International in Azerbaijan by the Ministry of Justice in January 2006. 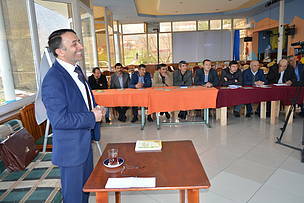 As a member of the global WWF family, WWF Azerbaijan works in close cooperation with the WWF Caucasus Program Office based in Tbilisi, Georgia. All the Caucasian offices of the WWF have a common ecoregional vision, goals, and objectives identified by the Ecoregional Conservation Plan (ECP), which is the joint work of some 150 experts from the Caucasus. Azerbaijan lies in the south-east Caucasus. In the east it is washed by the Caspian Sea, while it has long borders with the Russian Federation in the north and with the Islamic Republic of Iran in the south. In the west, Azerbaijan borders Georgia, Armenia, and Turkey. The territory of Azerbaijan divides naturally into five areas: the Greater Caucasus, Lesser Caucasus, Central Plain, Talish Mountains, and Nakhchivan. Azerbaijan is part of the Caucasus Ecoregion, an isthmus between the Black and Caspian seas, which serves as a bridge linking Europe and Asia. The country has rich biodiversity which historically was formed under the influence of the Turanian, Mediterranean, Near East, and European formation centers. Some 4,500 species of vascular plants belonging to 162 families have been identified in Azerbaijan. Of them, 940 species are considered endemic to the Caucasus, 22 species are relict, and 200 species are endemic to Azerbaijan. Invertebrates account for the largest number of animal species; 25,000 species of insects and 1,837 species of arachnids have been identified by scientists in Azerbaijan. Vertebrates include 11 species of amphibians, 61 reptiles, about 400 birds, and 110 mammals. Unfortunately, some species have recently become extinct (the Caspian tiger) and others are already threatened. One species of amphibian (Bufo eichwaldi), eight species of reptile (Darevskia rostombekovi, Eremias pleskei, Natrix megalocephala, Phrynocephalus horvathi, Phrynocephalus persicus, Testudo graeca, Vipera dinniki, V. eriwanensis), seven species of bird (Anser erythropus, Aquila clanga, Aquila heliaca, Falco cherrug, Leucogeranus leucogeranus, Otis tarda, Vanellus gregarius), and six species of mammal (Capra aegagrus, Gazella subgutturosa, Ovis orientalis, Pusa caspica, Rhinolophus mehelyi, Vormela peregusna) are considered globally threatened. One species of annelid, one mollusk, 78 arthropods, nine fish, six amphibians, 14 reptiles, 71 birds, and 42 mammals are included in the last edition of the Azerbaijan Red Book (2013). WWF ECP identifies 20 focal species for Azerbaijan (five species of sturgeon, five species of birds, and 10 mammals). Azerbaijan uniquely includes examples of nine of the world’s key climate types, which defines this diversity of species and ecosystems. Within a two-hour drive it is possible to visit several ecosystems in Azerbaijan. Starting from marine and coastal ecosystems on the Caspian shore, you can cross semi-deserts and steppes, deciduous forests, subalpine and alpine meadows, and reach the nival zone of the mountain peaks. “The Earth is our home!” drawing competition was held among schoolchildren in the villages of Shaki city. WWF supported Zangazur NP in order to strengthen leopard protection in Nakhchyvan AR.